In addition to a new DashCam and updated lineup of MagicMount Charge mounts, Scosche has unveiled BTFREQ, multi-function in-car adapter designed to power to up to two iPhones or iPads while also providing in-vehicle hands-free communications, entertainment, and Alexa support. At its most basic level, BTFREQ is a dual-port charger, with one USB-C PD 18-watt port and one USB-A 12-watt port, allowing for maximum speed charging for just about any mobile device, including Apple’s latest iPhone models. However, it goes beyond a simple charger by offering the ability to access Amazon’s Alexa voice assistant via Bluetooth while driving, allowing users to play music, hear the news, check the weather, and more, all with only their voice, although iPhone users can also choose to simply activate Siri instead. 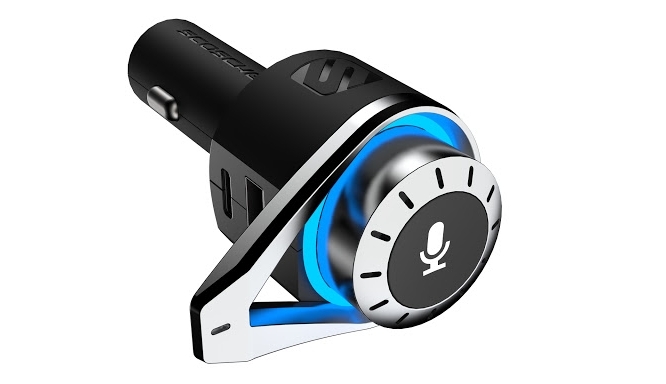 BTFREQ is designed to provide optimal voice recognition by using a second microphone spaced at an optimum distance from the first, and the BTFREQ is also built from automotive-grade ABS plastic that should have it looking right at home in most vehicles. BTFREQ will be available this fall. Pricing has not yet been announced.